United States boss Jurgen Klinsmann hailed his side's heroic performance after their last-16 exit to Belgium and says he hopes to build on their success at the 2014 World Cup in Brazil. The US were beaten 2-1 by Belgium after extra time but came desperately close to taking the game to penalties. "I'm very proud of our team," said former Germany striker Klinsmann. "Every player on the field made their country proud with this performance in this World Cup." Having captured the imagination of the US public with their displays in Brazil, Klinsmann is determined to improve even further in four years' time, adding: "All of the players went beyond their capabilities and I told them they should take a lot of very positive stuff back home with them. "We are doing everything we can in every corner of the country to find the talent. "We will continue to grow and grow, We are looking for all Americans around the world, no matter what background they have. It's all part of globalisation. "We have to learn more and more, we are in that process. I don't know how many years that will take but we have to take it to the opponent. Even if it is against very talented teams you have to play your game." Klinsmann also paid tribute to keeper Tim Howard, who pulled off a World Cup record 15 saves during the match. "What a brilliant night of football. Belgium deserved to win - with bells on. They had millions of chances, but the USA players were heroes. "They tell me Americans don't like sports they don't win at but surely there is glory in losing like this. Surely this will be the start of a massive change in the country." "What Tim played tonight was just phenomenal, outstanding - he kept us in that game for a long time," said Klinsmann. "We are proud to have him with us. "It was an absolutely amazing match and you can give him the biggest compliment in the world." 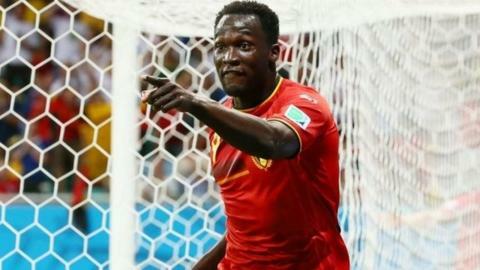 But Everton keeper Howard said the record meant nothing to him adding their "dream" of a quarter-final place had been ended by Belgium, who will now face Argentina on Saturday. "None of that really matters to me," he said. "I signed up to do that, to put my face in front of balls. If I had no saves or 20 saves it doesn't mean any more or less. It hurts when we lose. "We dreamed and we fell short of our dream but we got out of the group of death playing well and came up against a top Belgium side. "Hats off to the way we played. We are hungry, we have tasted what it's like to play against the best in the world and we will be back." Could Tourette's syndrome make a goalkeeper better? Read more on Who, what, why: Could Tourette's syndrome make a goalkeeper better?